Parachute games are one of the most popular activities among elementary school kids. The magic about playing with a parachute is that it is essentially a blank slate, the way you use it is only limited by your creativity. We believe this is what appeals to kids the most, especially since small children are bubbling bombs of creativity primed to explode. Leave them with a parachute for a couple of hours and you’ll find that they have come up with their own unique way to play with it – but sometimes it can be hard to come up with your own games. No worries, though! We’ve got you covered. In this article, we’re going to cover some of the best parachute games for kids to play. Below are 13 of our favorite parachute games. You could teach them to your kids as-is or add some variation to them and make the game more fun for everyone playing. Most parents use these games as a base to get their kids to start playing with the parachute and then encourage them to come up with their own games and cultivate their creativity. If you’re looking for some other great games you can play in your backyard, as well, don’t forget to check out our exhaustive list of 106 backyard games! Let’s begin with what is possibly one of the most popular parachute game there is. To play Popcorn you need several small balls and a parachute. Have all the kids hold on the ends of the parachute and make it taut. One of the adults throws all the balls on the parachute. This is going to be the initial position. At the signal, all the kids shake the parachute to make the balls fly in the air – as if they were on a trampoline. The kids try to keep the balls on the parachute as long as possible while still bouncing them. Once all the balls have fallen off, you start over again. Popcorn is a great way to pass the time that is simple to play too. Most young children have difficulty grasping games with complicated concepts. That’s not an issue here. To play Mushroom you begin by having all of the kids stand up and hold on to the sides of the parachute. You’ll need to have one supervisor who calls the game. It’s best to have an adult play the role of the supervisor. When the supervisor says “up”, everyone should lift the parachute overhead. As soon as the supervisor says “down”, everyone pulls the parachute to the ground at the same time. If everyone pulls down at the same time, the parachute will trap air underneath it, causing it to swell up. This makes the shute look like the bulb of a mushroom. This is an easy and entertaining game for kids to pass the time with. This game is very similar to popcorn. To play, the players hold on to the edges of the parachute and create small movements to make waves on the parachute. Some kids may want to create giant waves while others may want a flurry of small ones – that’s okay. The movements of the children do not have to be synchronized and they can all play individually. Making waves is a great game for kids to focus on having fun and is a break from most games where there is a clear winner. To play Pop the Bubble, you’ll need to have the kids stand on top of the parachute. The adults then hold on to the side of the chute and move it around to create an air bubble. The kids try to pop the bubbles with their feet as soon as they appear. In many ways, this game is similar to another 90’s classic: Whack-a-Mole. It goes without saying that kids don’t like to study or stay inside much. Most would rather be outside playing with their friends – and we don’t blame them either. How many young kids would willingly spend their days inside instead of running around in their yard? Trying to get kids interested in studying is one of the biggest problems most parents face. Well, we feel we may just have a solution to your problem. Combining the fun aspects of playing on a parachute with some educational concepts is a great way to covertly get your kids to learn new things. To get started, you’ll need to have the parachute laid out bare on the ground with the kids standing on it. An adult will play the role of the supervisor and issue instructions. Most instructions usually have a “touch the color that…” format. If your child is still learning about colors, then this is a great way to teach them about colors and issue instructions like, ” touch the red stripe”. Touch the color to the left of the red stripe. Put your left leg on the green stripe and your left hand on the yellow one. Touch the 2+2th color to the left of violet. The great thing about Colors (besides the fact that it’s fun and educational at the same time) is that a child can play it alone, too. All you need is an adult to issue instructions and 1 kid to follow them. Camping is pretty similar to Mushroom and in many ways can be seen as a slight variation of it. Just like in Mushroom, you’ll need to have all of the kids hold on to the sides of the parachute with a parent issuing instructions. When the adult says “up”, the kids should raise the parachute overhead. However, there is a slight difference in the way the kids raise the sheet than Mushroom. When playing Mushroom, the kids raise the chute slightly in front of them, but during Camping, the chute will be held over them. At the signal, the kids pull the parachute down and put themselves under the chute. By doing this, they transform the chute into a makeshift tent. If there is no supervisor, you can have one of the kids holding on to the chute play the role of the leader and issue the instructions. All you need is a parachute to play Under the Bridge. Appoint one player to play the role of the supervisor – if there is a parent present they can play this role in the place of one of the kids. To begin the game you’ll need to have all of the kids hold on to the sides of the parachute and raise it overhead. The supervisor will then randomly call out a player. The chosen player has to try to get from one side of the chute to the other by traveling underneath it. But there’s a catch, the remaining players will try to trap him or her under the parachute as he or she is traveling. If caught, he or she has to become the next supervisor and the game starts all over again. However, if the player makes it to the other side then the game still starts over again without a change in the supervisor. Make sure that the supervisors are constantly changing and everyone gets a chance to play. 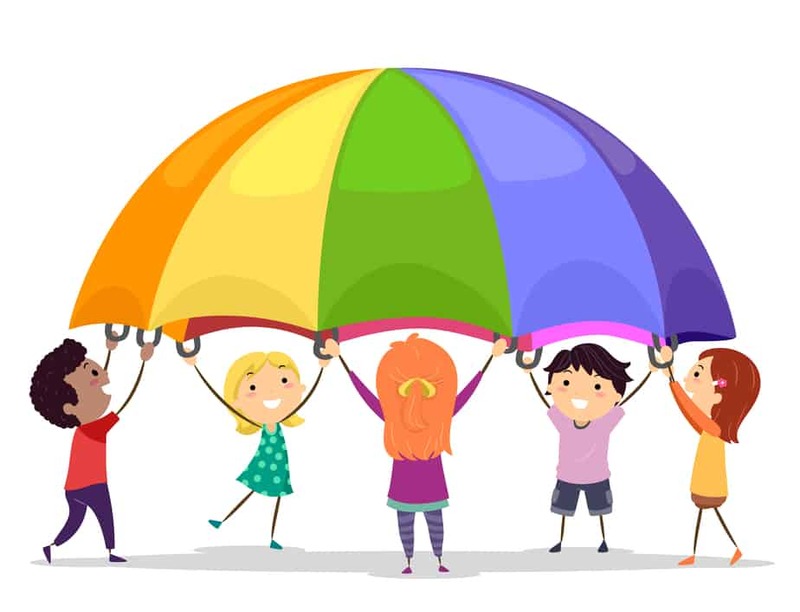 If you find that most kids are making it through the parachute without getting caught, then change the rules so that a player making it through will become a supervisor instead of the other way around. To make the game more fun for kids, it’s best if you have an adult to permanently play the role of the supervisor. To play Basketball, you need a group of at least 8-10 players. To start, group the players into pairs of two and give one player in each pair a small (baseball-sized) ball. Ideally, the ball should be small enough to fit through the hole in the middle of the parachute without any problems. Have one player in each pair hold on to the sides of the parachute and make a mushroom (see the guide on Mushroom). The other players with the balls will then position themselves a foot behind each player in their pair. These players will then try to throw the ball through the hole of the parachute. If a team manages to throw the ball through the hole, the players switch positions so that the one who was holding the chute becomes the new shooter. The first team to make the ball fall through the chute 10 times wins the game. Circular Situps are a great way to incorporate some fun activities in your child’s typical exercise routine. Not only will this game help kids get fit but it’s also fun to play. To play, you’ll need to have all of the kids sit along the edge of the chute with their legs underneath it. On your command, players from one side will lean backward while the other sides lean forward. The players repeat this until there is a seesaw effect. At first, the movements will be extremely chaotic and messy, but there is no need to correct them. After a couple of movements, the kids will find their rhythm and will start to move together in perfect harmony. Trying to correct the kids prematurely will only hurt their rhythm. However, in some cases, you may have to dictate which kid needs to lean back or move faster, etc. To make the game slightly harder to play (or as a slight variation), you can tell the kids to move in a circular motion from the waist. If all the players do this correctly, the parachute too will move in a circular path. Mousetrap is a fun game where the players work together to trap a chosen player under the parachute. To start, give each player a designated number and have them hold on to the sides of the parachute. Make each player hold the parachute overhead, as high as they can. You also want to ensure that the parachute is taut. A great way to make sure of this is to ask each player to take a step back once they pick up the chute. If the players manage to pull the parachute down before the “mouse” escapes then the designated player loses. Otherwise, the mouse wins the game. Most children’s games have an element of silliness to them. Alligator is no different – it’s a fun, light-hearted and an extremely goofy game. Your kids will love it! To play Alligator you need at least 4-5 kids and a parent/adult in charge to manage the game. Ask the children to lie down on the ground and pull the chute to their chin – like a blanket. At the coordinators signal, all the kids will pretend to fall asleep with their eyes closed. The coordinator will then walk around the circle and tap one of the players on their shoulder. This player will become the Alligator. The Alligator now has to crawl under to ‘eat’ the sleeping kids by pulling them inside the parachute. While being pulled, the student has to scream as loud as possible to warn others. After being eaten by the alligator, the player will also turn into one. The game is played until all the kids turn into alligators. If all the players are converted to Alligators, then the original Alligator wins the game. However, if the remaining players correctly identify the original alligator then the players win! Children have some of the most vivid imaginations in the world. Weather Man is a unique game that encourages a kid’s imagination in their play. To play the game, the players hold on to the sides of the parachute and pretend that it is an ocean. One of the players plays the role of the weatherman and calls out weather reports. The players must move the parachute according to the weather report they hear. For example, if the weatherman says, “the weather report says today we’ll have a slight breeze over the Atlantic ocean”, the children will respond by making small waves in the chute. On the other hand, if they hear a strong wind or a tornado, the kids will shake the parachute violently. One thing to note here is that there is no correct answer, the kids will move the waves in a way they imagine it to be and you want to encourage them to think differently even if you think they are wrong. Switcheroo is a game of coordination and is a great way to test the limits of how well the players can work together. To play, you’ll need to first divide everyone into two groups. Each group is given a parachute and are made to hold it overhead. You also want to make sure that each group is standing next to each as two adjacent circles. Ask one of the groups to walk in a clockwise direction while the other group is made to walk in an anti-clockwise direction. When a player in one group comes to the point where they are right next to a member of the other group, they leave their parachute and switch to the parachute of the other group – essentially joining the other circle. The player on the other group will do the same thing, thus exchanging places with each other. When done perfectly this should look like the players are walking in a giant figure eight. To play this game well, you need the players to work together and coordinate when they will drop their own parachute to lunge for the next. If the game gets too easy or boring to play, you can ask the players to pick up the pace – maybe even start running. You could also ask the players to move in the opposite direction after some time. 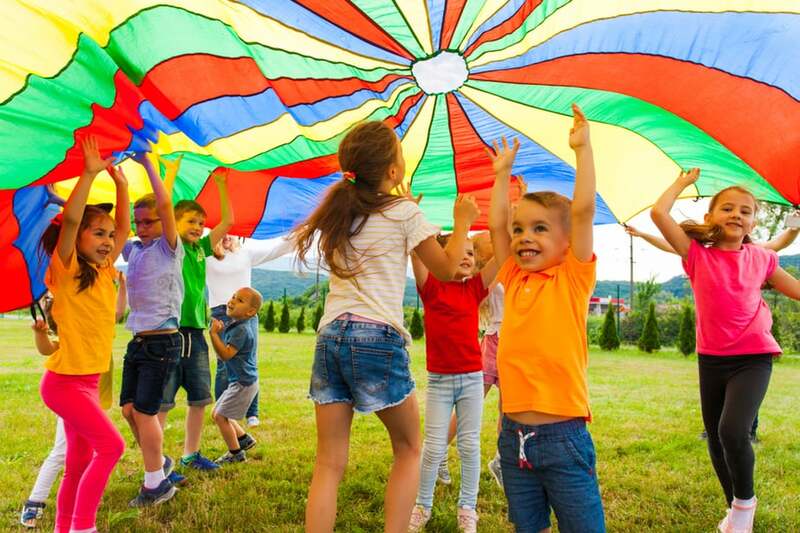 Unlike most games these days, parachute games encourage kids to communicate with each other. 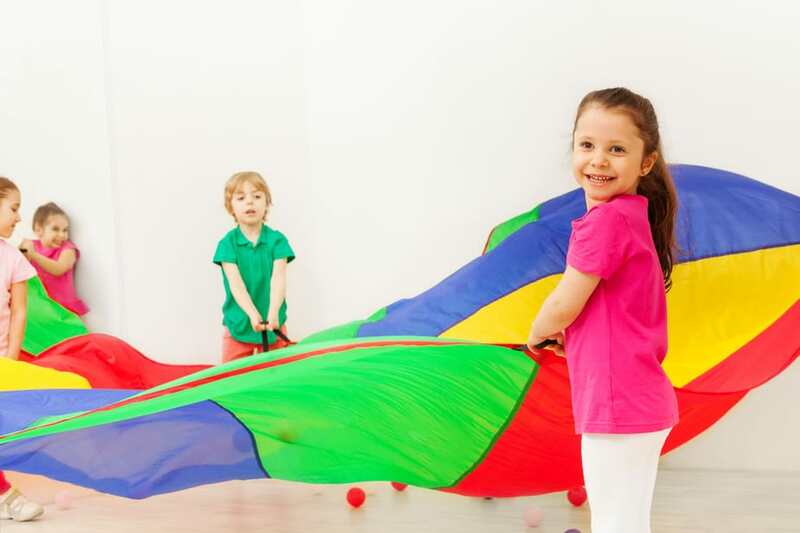 Playing parachute games is a great way to have kids interact since they promote social interaction. You’ll find that as the kids are laughing and giggling with one another they quickly become good friends. Similar to promoting social interaction, parachute games also require the kids to work together. Many studies have found that individuals who work together tend to be much better and happier than their lone wolf colleagues. This is true even if the lone wolf is much better than the team player. 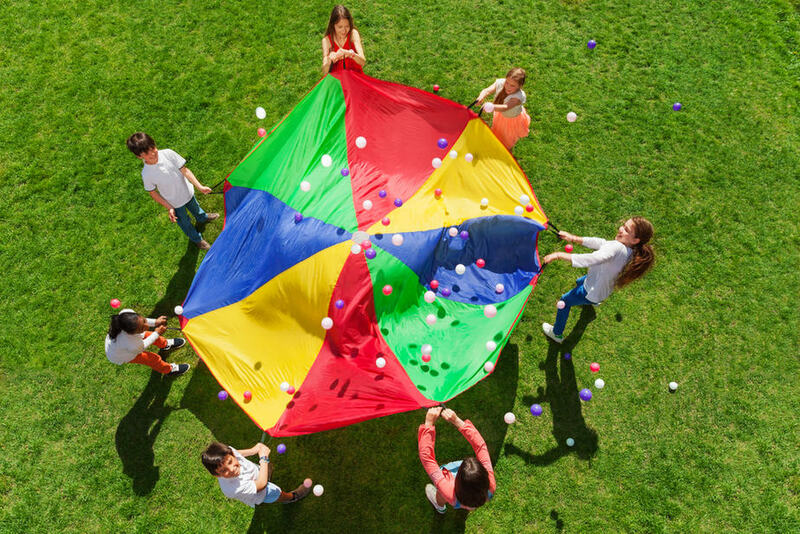 Parachute games are one of the best ways to encourage kids to work together and teaches them that only by working together can they all win. Most parachute games involve a lot of upper body movement to create waves. This is really useful to a developing child. Building upper body strength in young kids usually leads to better bone density, self-confidence, and hand-eye coordination. To make waves or create a mushroom, kids need to have a sense of when and how to move. This is especially true in games like circular situps which are overly reliant on the rhythm. Playing such games will eventually hone the rhythm within the kids that play them. This is incredibly useful and is a great way to develop this way of movement in children. So there you have it; 14 of the best parachute games for an incredibly fun and wonderful playtime for kids. Everyone is sure to have a blast with these games. If you have a variation to suggest, we would love to hear about it, too. Drop us a comment below with your favorite parachute games from this list or just one of your own. Have fun!